Is former minister of finance of New Zealand. She pioneered the world’s first code of fiscal responsibility and was the architect of free-market reforms and spending cuts in the 1990s. During the inaugural lesson, Ruth Richardson expounds the importance of liberty and individual choice and how they drive growth and innovation. In an early age, she decided and prepared to be an agent of change in her own country. 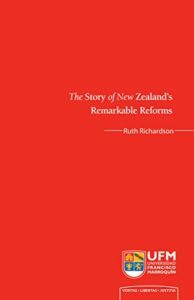 As a reformer, she used New Zealand’s success story as an example of political transformation. These political changes bring about the vast production of goods and services. She also emphasizes that the current disruptive technologies are a powerful tool for democratization. She concludes that economic liberalization is primordial and overall possible when establishing a good and responsible government.